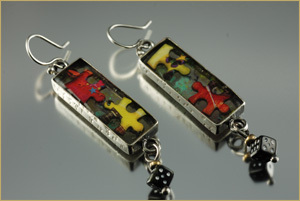 Earrings at Barbara Briggs Designs - custom, unique, one-of-a-kind silver jewelry. A very long time ago, when I was a just a little girl, there was a gift shop that my mother and I used to frequent. The store, aptly named Rockledge because it was built on a cliff overlooking a picturesque waterfall, was stocked with tasteful items and curiosities: children's books (my "First Steps in Ballet" book was purchased there), gifts for golfers, cooks, and collectors to name a few. Among one of my mother's many sporadic purchases, was a strand of tiny bells from India called "Bells of Sarna". I still have several bells from that strand which I found tucked away in a basket while readying my mother's home for sale. 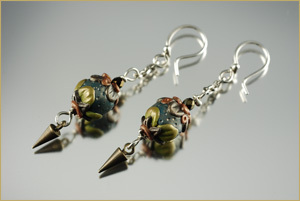 The bells now hang from a lamp on my workbench and were my inspiration for these bronze and fine silver metal clay earrings. Thankfully they are very quiet - I find earrings that tinkle and jangle disturbing when rattling next to my ears! They are light weight and very comfortable to wear. Materials: Fine silver metal clay with 24k gold keum boo, sterling silver, bronze metal clay. They measure 21mm x 49 mm in length. Sold. 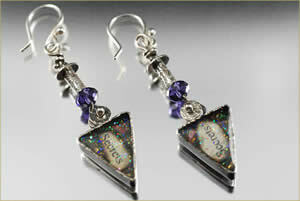 Lightweight and novel, these asymmetrical earrings are such fun to wear. 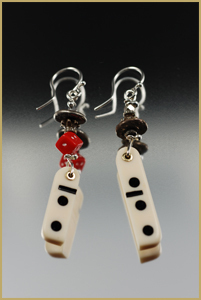 Made from a bakelite domino that I've altered by sawing in half lengthwise, one earring sports a bright red die. 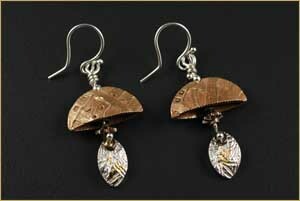 Both are topped with bronze disks and swing from sterling silver earwires. Sold. There is so much beauty in the world! These earrings are a reminder to look for the good in everything. 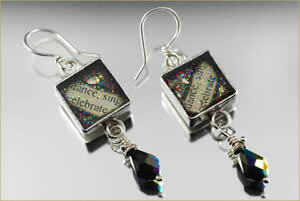 Each earring contains text in a small sterling silver square. 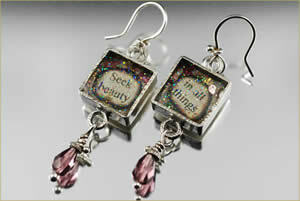 Embedded in jeweler's grade resin, I've placed the words "Seek beauty" in one earring and "in all things" in its mate. A tiny mauve crystal teardrop dangles at the bottom of each earring. Comfortable and lightweight, they swing on sterling silver earwires. Each earring measures one half inch in width by two inches in length. $110for delivery. Tiny colorful floral buds made of polymer clay petals swing to and fro as if dancing in the wind. 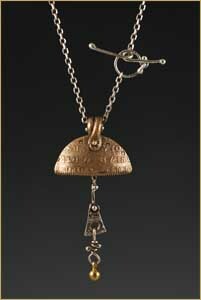 An antiqued brass dangle gently swings at the bottom. Each bud measures one centimeter round. They are suspended from sterling silver ear wires and measure a little over one inch in length. You may order these in your favorite colors. Sold.